Tom Stokes is set to make his Peterborough Panthers debut. Peterborough Panthers team boss Jason Attwood insists a League Cup clash against Ipswich tomorrow (May 22) is far from meaningless. Neither team can advance to the latter stages of the competition, but the remaining Midland Group fixture must still be completed at the East of England Showground (5pm). Nikolaj Busk Jakobsen is injured. And Attwood is adamant both clubs will be determined to win ahead of another East Anglian derby clash in the Premier League at Alwalton eight days later on Bank Holiday Monday (May 30). Attwood said: “We have two new signings in Craig Cook and Tom Stokes coming into the team and the meeting will give them valuable track-time. “We’re certainly disappointed that we can’t make it through to the semi-finals, and I’m sure Ipswich feel the same way. “Both teams will want to win on Sunday and also get dialled into to the track ahead of the league fixture on Bank Holiday Monday. A series of mouth-watering battles are in prospect involving new Panthers number one Cook and another of the top riders in the Premier League, Ipswich main man Danny King. The Huntingdon-based King is one of three former Panthers riders in the Witches side along with Morten Risager and Ollie Greenwood. They are bossed by Ritchie Hawkins, who also had a brief spell in Panthers colours during his racing days and is the son of one of the club’s greats, Kevin Hawkins. Panthers are without Nikolaj Busk Jakobsen, who continues to feel the effects of a big crash at Plymouth almost a fortnight ago, and Tom Perry, who would have been promoted into the main body of the team, but for suffering a collar bone injury riding for Birmingham on Wednesday (May 18). Panthers will operate rider replacement for Perry, but have secured the services of Kenneth Hansen as a guest for Busk Jakobsen. 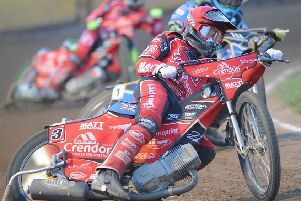 The Dane is expected to return for two meetings on Bank Holiday Monday (May 30) – an afternoon trip to Scunthorpe ahead of that home clash against Ipswich at night. PANTHERS: Craig Cook (10.35), Rider replacement for Tom Perry, Ulrich Ostergaard (8.13), Emil Grondal (5.35), Kenneth Hansen (guest), Simon Lambert (4.63), Tom Stokes (3.00). IPSWICH: Danny King (9.41), Lewis Kerr (7.03), Morten Risager (6.98), James Sarjeant (4.41), Nico Covatti (7.84), Paco Castagna (3.00), Ollie Greenwood (3.00).